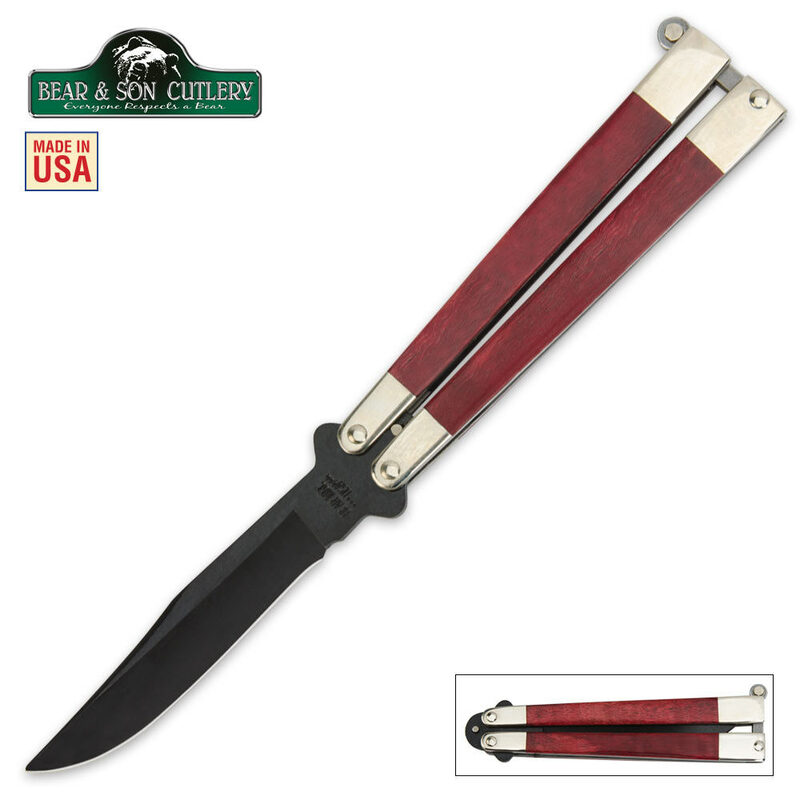 Continuing its proud lineage, this butterfly knife from Bear & Son Cutlery is made right here in the USA, featuring a 3-1/2" hollow ground stainless steel blade with a non-reflective epoxy powder coating and a hand-sharpened edge. The attractive red handles are carefully crafted of American curly maple and polished to a smooth, shiny finish for an elegant look and feel. Dress up your butterfly knife collection with this handsome design. 5-3/8" closed length. I would recommend this knife over almost any other balisong in this price range. This knife surpasses many bear ops knives and is almost as good quality as my Bradley Kimura XI. At first I was disappointed in this knife because it was so stiff. However, after some lubing (I recommend mineral oil) and use (a little under a week) this knife loosens up and flips with ease. Not that sharp so you won't cut yourself every time you mess up a trick. It handles stiffly at first, but after about a day of usage it handles great, perfect for tricks, nice and weighty if you want to use it as an impact weapon. Only complaint I have is that when it came in the mail the box was crumpled and open, and the knife haphazardly fell out sometime during transit. A bit stiff to use at first, but after a bit of usage this knife handles like a champ.